Last week video emerged of a giant fissure in the Northern Mexican desert, 3,300 feet long and up to 25 feet deep. Speculation centered at first around an earthquake, but the region is not known for seismic activity. I personally checked out the USGS earthquake data because the Buena Vista Copper mine (the fourth largest in the world by output) is only about 150 miles north of the enormous crack, and earlier this month they spilled 40,000 cubic meters of sulphuric acid into two rivers during the worst spill in Mexico’s modern mining history. But I found no reports of tremors in the region and authorities were skeptical that this had anything to do with an earthquake. The chair of the geology department at the University of Sonora, in the northern Mexican state where this “topographic accident” emerged, said that the fissure was likely caused by sucking out groundwater for irrigation to the point the surface collapsed. I’m sorry, no. These are not normal manifestations of natural activity, this is the result of human activity run amok. Just because Cthulhu isn’t clambering out of the breach to wreak havoc on humankind DOES NOT MEAN we shouldn’t be alarmed by the fact we’ve sucked so much water out of the ground that the surface of the earth is collapsing. The Post also reports that cotton used to be a major crop, but intrusion of saltwater from the Sea of Cortez caused some areas to become unusable for agriculture. 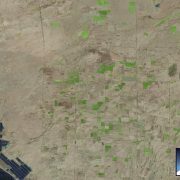 However, there is still plenty of large-scale agriculture as evidenced by the Landsat image below. (Above) Hermosillo region of Sonora, Mexico, as seen by Landsat 8, on August 17, 2014. 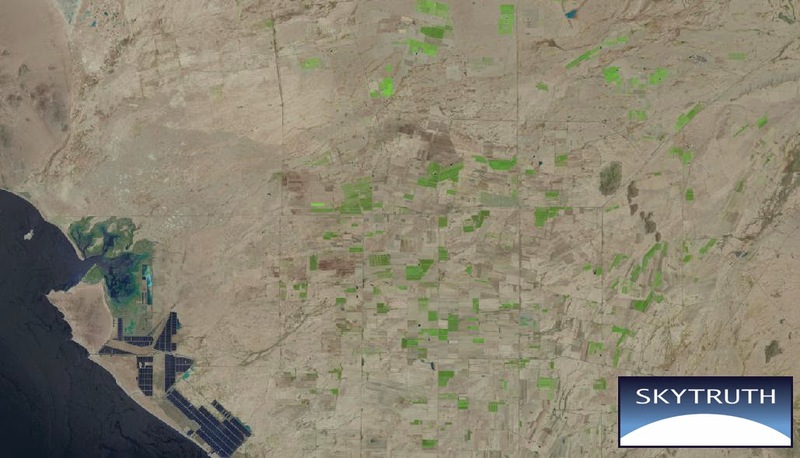 Bright green rectangles in the middle of the desert are irrigated fields. However, around the green fields, there appear to many fields that are not being irrigated this season – seen as tan rectangles with a faint grid of roads in between parcels. The blue geometric shapes on the left appear to be salt-drying pans. Groundwater reserves can take centuries to recharge, so industrial-scale extraction of water for big agriculture in the middle of the desert cannot continue forever. In the US, water managers are facing an uphill battle to control water use in the Colorado River Basin and from the Ogallala Aquifer which stretches from Texas to South Dakota. 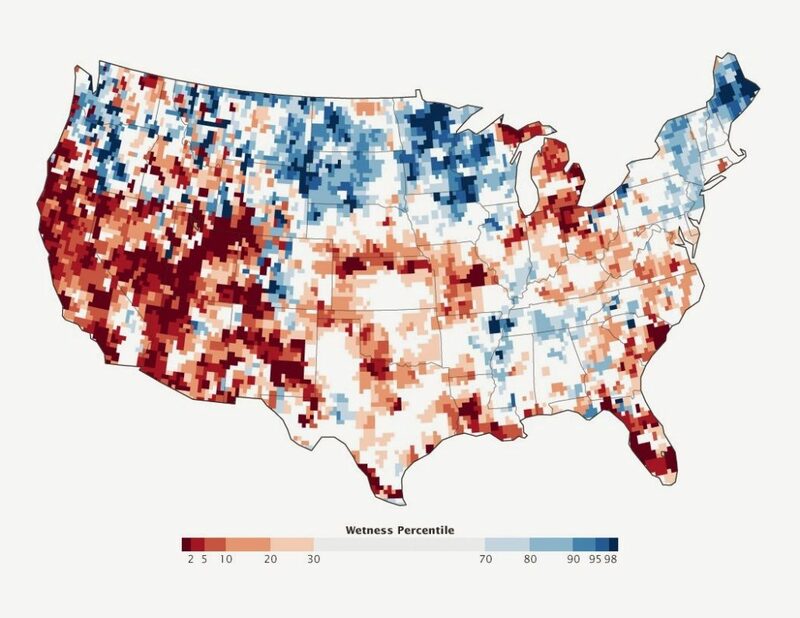 Factor in that hydraulic fracturing is permanently removing water from the hydrological cycle in some of the most drought-stressed regions of the West, and you have a serious problem. To be clear, the southwestern US and western Mexico are not necessarily about to fall in on themselves all at once, but they are struggling to support large-scale agriculture, enormous demand for water from a revitalized onshore oil and gas industry, and a growing population. Maybe this chasm in the desert doesn’t herald the coming of Judgement Day, but perhaps we should be ‘freaking out’ about our poor judgement. as a species, we are such idiots. We're too darned successful for it to be simply luck, so we must have some smarts going for us. But we do have our weaknesses, shortsightedness being one of the most obvious. Hurry up, evolution! SkyTruth Releases Dynamic Map of Global Flaring Playing Hide-and-Seek! With an Oil Tanker.